Footprints has been operating since May 2006. First in Dumfries, at the Lochthorn Private Clinic and later the same year, the new premises opened in Gatehouse of Fleet. 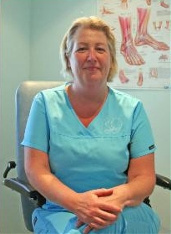 Since that time the client base has grown and the range of services developed offering holistic treatment, in addition to the traditional services offered by a podiatrist or chiropodist. The business is owned, managed and operated by Julie Allan. "An excellent service. First class job. Nails look so much better"